AFRICAN AMERICAN REPORTS: Sheriff David Clarke suddenly remembers he's black and plays the race card. Sheriff David Clarke suddenly remembers he's black and plays the race card. 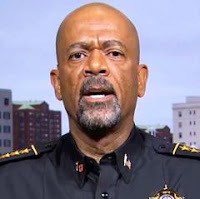 When Milwaukee Sheriff David Clarke learned that the University of New Haven rescinded its offer for him to be the keynote speaker on a forensics discussion he was livid and the poor baby's feelings were hurt. He blamed the rescinded invitation on his past comments on Black Lives Matter and went so far as to play the race card. The University is aware that some people, including current students and alumni, are upset that Sheriff David Clarke’s invitation to speak at the Markle Symposium was rescinded. As an institution of higher learning, we fully support free speech and value the marketplace of ideas. Unfortunately, circumstances did not permit Sheriff Clarke’s attendance at this year’s symposium, and we respect the resulting divergent reactions among the University community. President Steven H. Kaplan, I understand why you don’t want people to know that a predominantly white college won’t let a black man speak on campus because of your incredible support for minorities. That doesn’t even pass the “straight face test.” If you think my beliefs should prohibit me from speaking about collecting, preserving, and analyzing evidence, that’s your decision as a private school. Wow isn't that something, the man who believes all black people stopped by the police are belligerent, don't respect authority, and if they get shot it's those black people's fault suddenly remembers he's black and claims he was uninvited because he's black. No, Sheriff Clarke, you were uninvited because you are a diva, a self-hating diva but still a diva.